I came across recently a heart touching story of a Pakistani woman, who had come to India to meet her ailing father. The poor lady got stuck in India and could not go back because of that greatest bane or woe of many international travellers: a visa. Those of my readers, who have been on international travel, will easily vouch that getting a visa is perhaps the most formidable obstacle that can come in way of any planned international travel. There are some lucky people; mostly citizens of either western or affluent countries; who are spared of the hardships of getting visas, as they have free access to enter any country of their choice without obtaining a prior visa. Let us leave them aside and concentrate on people from other countries, who are not so fortunate as far as visa regimes are concerned. I have had my own share of irritations and exasperation caused while fulfilling the visa requirements of various countries. But narrating those would be another long post, so I would just restrict my self to one episode. While travelling in US, I went to city of Buffalo; N.Y. state to see the Niagara falls. After having watched the falls from US side, I thought of just walking across to other side of a bridge that connects US and Canada. I walked to the other side but found that a Canadian customs building blocked my view of the falls. I did not have a Canadian visa and never wanted to enter Canada. I just wanted to see how the falls look from that side. Canadian customs refused and did not allow me that and I had to walk back. Luckily I had a multi-entry US visa, so I could enter US again. I do not know what would have happened to me if I had a single entry visa for US. Some relatives of mine had this unfortunate experience while visiting Singapore recently, from where they travelled to Malaysia. Since they had to catch their return flight from Singapore, they returned back. At the entry point they realised that their visa was a single entry visa and was no longer valid. They could not return to Malaysia because even that visa was single entry. It look lot of efforts to get a temporary transit visa to enter Singapore. In many big cities there are two international airports (e.g. Heathrow and Gatwick) and flights to different destinations leave from either of the two. If by mistake your itinerary involves transfer between these two airports, you have it, because you just can not do that unless you have visa for that country. In earlier days, when we booked tickets through travel agents, they took care of all these things, including visa. Now a days, buying on line tickets has its own peril. You need to find out whether you need a visa and have to arrange it yourself. I could really go on and on. But let us return to our main story; that of the Pakistani women. This Pakistani lady Mai Fatima, her husband Mir Muhammad and her two children leave in Ghoki tehsil in Pakistan. Mir Muhammad is a subsistence farmer hailing from Ghotki district in Pakistan’s northern Sindh region. Mai's father's family used to live at Basanpir in Jaisalmer district, Rajasthan state of India. In February 2014, when Mai was expecting her third child and was 7 months pregnant, she received an urgent message from her mother, that her father was not keeping well. Extremely worried, Mai obtained visas for India for her family and left for India. Unfortunately, after Mai reached her father's house in India, her father expired within next few days. The time passed quickly as Mai had to console her mother, who was in terrible grief. At her mother's insistence, she got her visa extended by another month. Next 20 days were terrible for Mai and her husband Mir as they ran from pillar to post to get visa for their new child and extend their visas also. 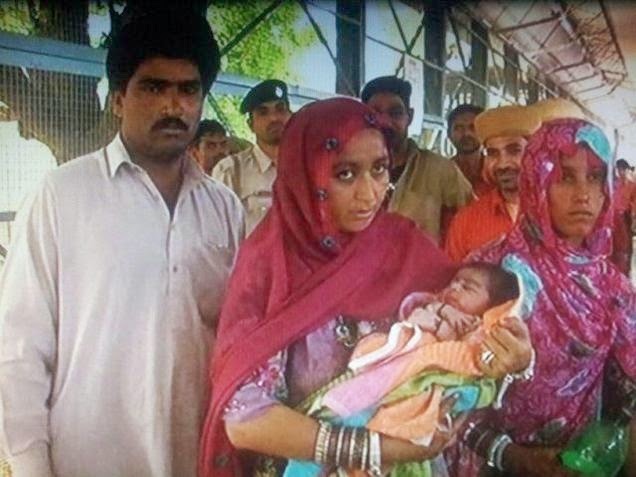 In just one week, she had to travel to Munabo, Delhi, Jodhpur and Jaisalmer many times and she and her newborn had to face lot of problems and both she and her child fell sick. Her son, 20-day old sohail could not bear the heat and he suffered from diarrhea and vomiting. Finally last week Mai and her guarantor Rasool khan managed to get an appointment with Pakistan high commissioner in New Delhi and could narrate her story to the Pakistan high commissioner at the Pakistan embassy. The embassy within an hour issued the visa and necessary documents to the newborn. The documents issue finally settled, Mai lost no time and finally said good bye to India and left for Pakistan on 2nd May 2014 from Jaisalmer for Jodhpur and at Jodhpur she left for Munabao by Thar express at night from Bhagat ki Kothi railway station. 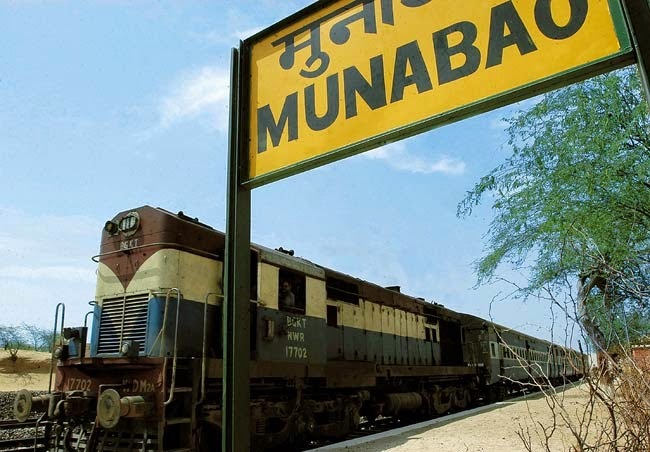 Next day, at Munabao railway station, immigration officers after checking the documents of newborn and other members gave clearance to go to Pakistan. 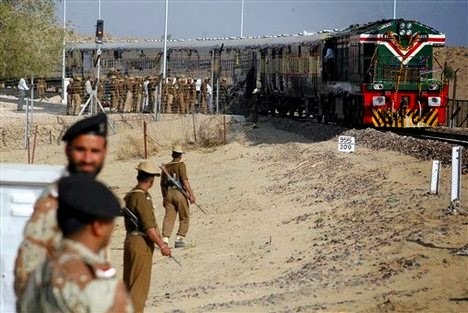 At 3.30pm, the train entered the Pakistan border and finally she was home. What really touched me was that this simple woman, who had to go through such hardships because of a simple miscalculation about her date of delivery, bore no ill will towards any one. While leaving for Pakistan, at Munabao station, her eyes were filled with tears of joy. She bid farewell to security personnel by waving hands. That is something really great.